Gosh, I can't believe this three day weekend we just had is OVER already! It seriously feels like yesterday was Friday and I'm back at work already ugh! Time always flies when you're having fun and then goes as slow as molasses when you're bored. The life we live! This weekend was truly one for the books though. I had a great time with my family and I hope you guys did too! So you may be wondering why I have the picture that I have posted at the top of this post. I know it is a little random haha. 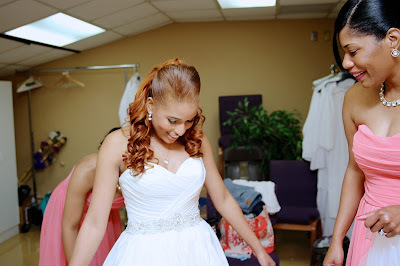 It is the picture of me on my wedding day when I first put on my dress and I was admiring how amazingly gorgeous the dress is AND I was just so happy to be getting married! This is why I had the biggest grin ever on my face. Reflecting on that moment, and other moments like it make my mood instantly better all the time. No matter what is going on, and although it's super easy to be down because today is the Mondayest Tuesday EVERRRR, we have to still try our best to be happy and upbeat. Why? Because it is good for our overall health. Yes, I said it and it is true. Happiness helps you to be healthier. I know it can be hard sometimes to be happy when it seems like everything is just hectic and crazy, but just trying to find that silver lining in an unwanted situation can make all the difference in your day and life. So here we go...Here's a list of things I do that make me the happiest. Above number one, the main thing I do when I am REALLY feeling down, is I talk to the Lord. He always lifts my spirits. So when you're really going through it and none of the below things will work for you, make sure you seek out our Lord and Savior. 1. Spend time with my husband. Literally my favorite thing to do. He's my best friend. 2. Spend time with my family. 3. Spend time with my friends. I mean, shopping can pretty much make almost everything better! 5. Dance around the house to my favorite music. 7. Hot Cheetos or Hot Funyuns. I eat way too many of these, but I can't help myself. 8. Read inspirational messages or blog posts. 9. Reminisce on my childhood by watching old tapes of myself as a child. Seeing myself back then is so refreshing. I miss having no worries other than what doll I want for Christmas or going to dance practice. 10. Sing extremely loud in the car. 11. Buy something nice for someone I love that I know they will love. 12. Random acts of kindness. Either performed by myself or reading or hearing about the ones others do. 13. Text my best friends. This is so much fun for me! Finding new ways to wear the clothes I have in my closet is exciting! 15. Read a great book. 16. Watch my favorite old school shows. A Different World all day... every day. 18. Play with my makeup. So guys, that was my list! I'd love to know what you all think, and if you have any cool things you do to make yourself happy, please drop me a comment below! I thoroughly enjoyed reading this! I'm going through it today and blasting my music in the car and singing just as loud is always a mood lifter.